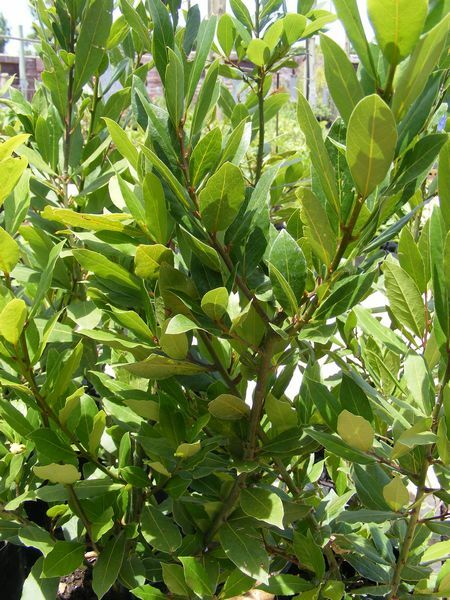 Bay Laurel is native to the Mediterranean. 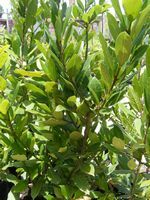 It is a dense evergreen shrub or small tree with leathery pointed leaves. Clusters of small cream cream-yellow flowers (male and female flowers on seperate plants) appear in spring followed by dark purple berries. It needs well-drained soil in sun or partial shade and is hardy and draught resistant. Trim to shape in summer . Propagation can be done by semi-ripe cuttings and the removal of suckers in summer or by layering in autumn. vegetables, pickled food and sweet dishes like custard and creams. The leaves and branches are collected in summer and dried whole. The dried leaves loose their flavor after about one year. Stimulates secretion of digestive juices. Promotes digestion and absorption of food. Rub baylaurel oil onto rheumatic/ sprained limbs and bruised skin. A leaf in a jar of flour or rice will deter weevils. Pick leaves and dry them slowly away from direct sunlight. Store in a jar away from strong light. To keep them flat - dry the leaves between 2 sheets of paper.